The comma operator (,) is used to execute two expressions sequentially. We use the comma operator when we want to include multiple expressions in a location that requires a single expression. 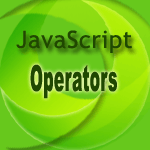 This operator is generally used inside a for loop, to allow multiple variables to be updated (increase/decrease) each time through the loop. For example, we want to display a serial No. (starting from 1) and an employee code ( starting from 10 ), the following code uses the comma operator to increment two variables at once.